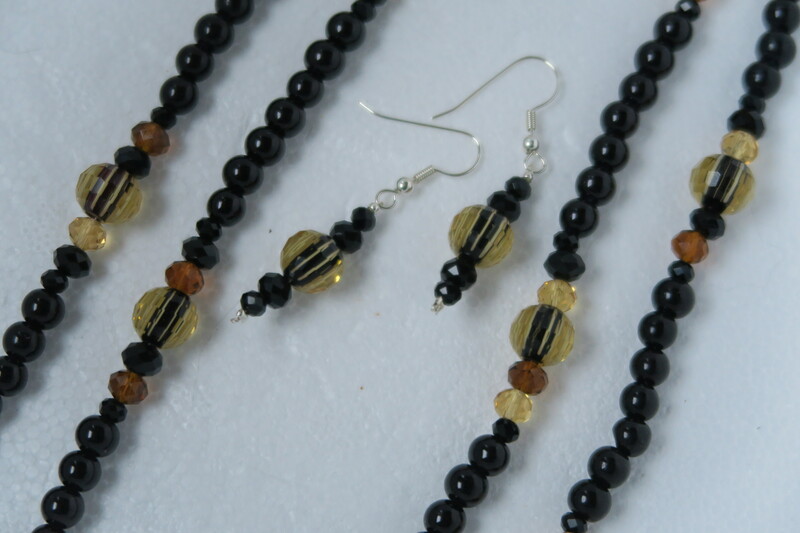 “Lucy Loves… Jewelry is designed and made by Lucy using quality beads and findings. Her designs are classic and wearable with almost any outfit you wish to pair it with. 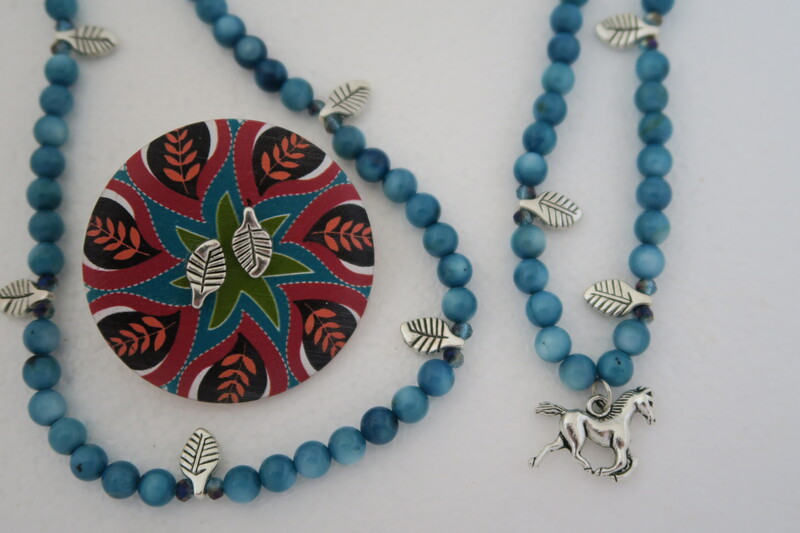 Included in Lucy’s line is a collection of jewelry for horse lovers. 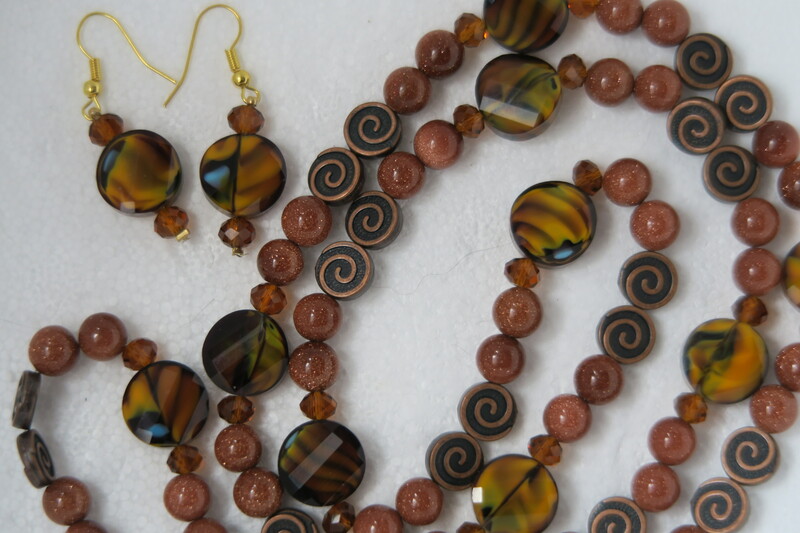 Be the eye of your own inner tiger, or pamper a brown eyed girl with these beautiful glass beads inspired by the eyes of my favorite, bay colored horse. Highlighted with flecks of brown and marigold, surrounded by copper toned glitter embedded beads and further accented with copper metals and gold toned hardware, this lovely strand will take you from day to night with ease. Also a wonderful gift for gals who love the vibrancy of fall. Wear the crisp sultry season year round. Their is a nice hand and weight to this generously long 34″ necklace making it a stand-out piece. 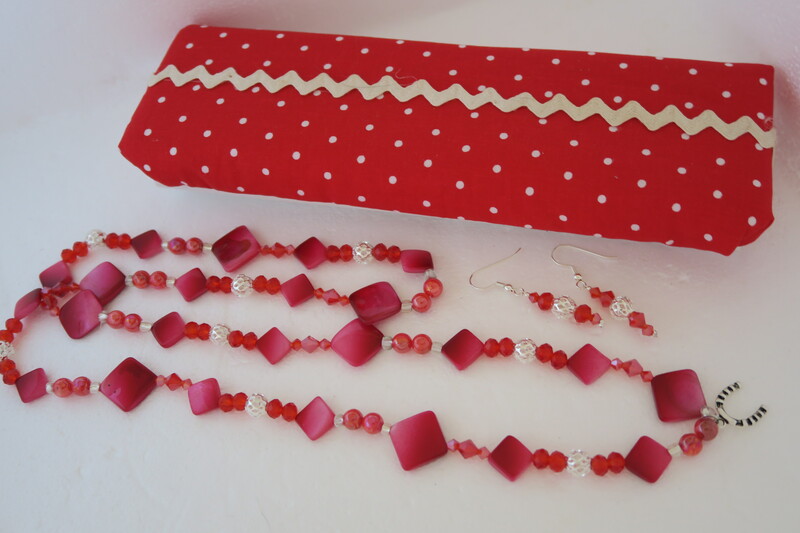 Matching earrings are approximately 1″ long. Summer or winter, “Lucy Loves Horses” will have you dreaming of trail ride.filled with dashing dragonflies and lavender blossoms! This generous 34″ long strand of smooth, shining glass in mottled shades ranging from soft lavender to rich, royal purple are interspersed with tiny silver butterflies and rich blue faceted crystals. Everyone will recognize your love for your four legged friend from the silver horse head centered inside a lucky horse shoe charm. These beads have a great “hand” and are heavier and more substantial than you might expect. 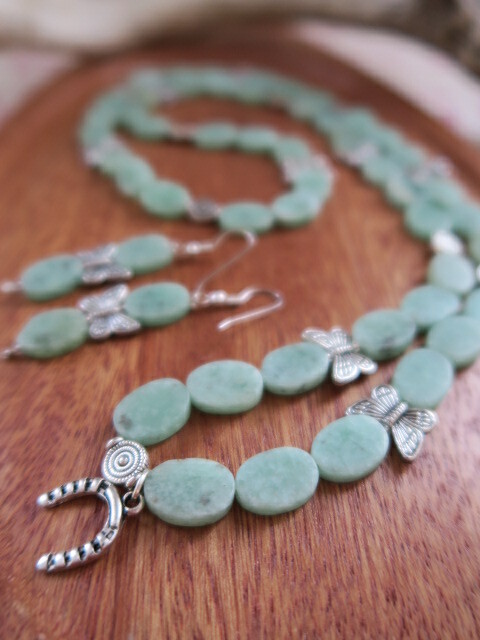 Earrings feature matching beads and silver dragonflies. 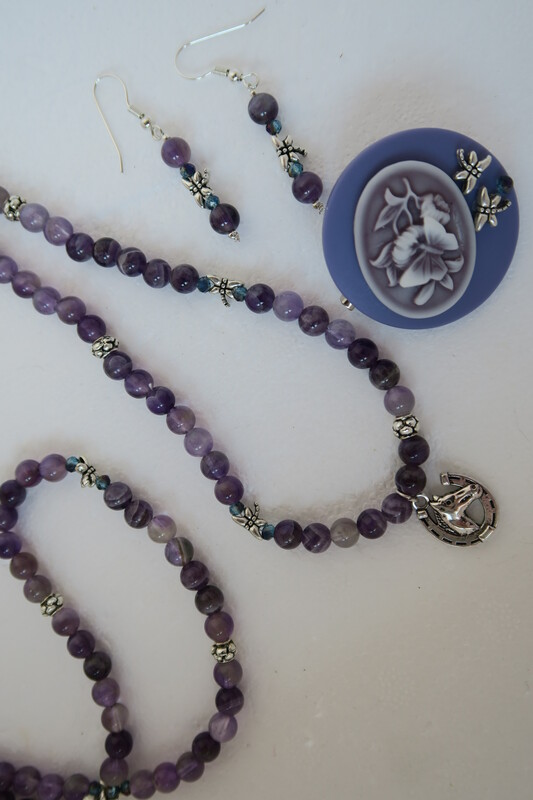 The third piece of this collection is a beautiful butterfly cameo set onto a deep lavender colored pin that is embellished with matching silver dragonflies. Life isn’t all about horses (Don’t ever say that in front of Lucy though!). And sometimes you just want to be be fashionable without having to work so hard to get there! 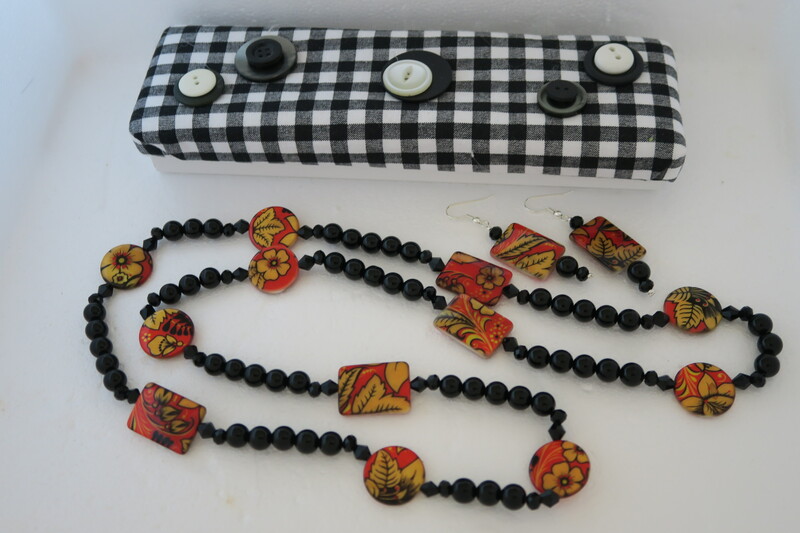 “LucyLovesHorses” brings this gorgeous black glass bead necklace and matching earrings that’s neutral enough to be worn with almost any outfit. 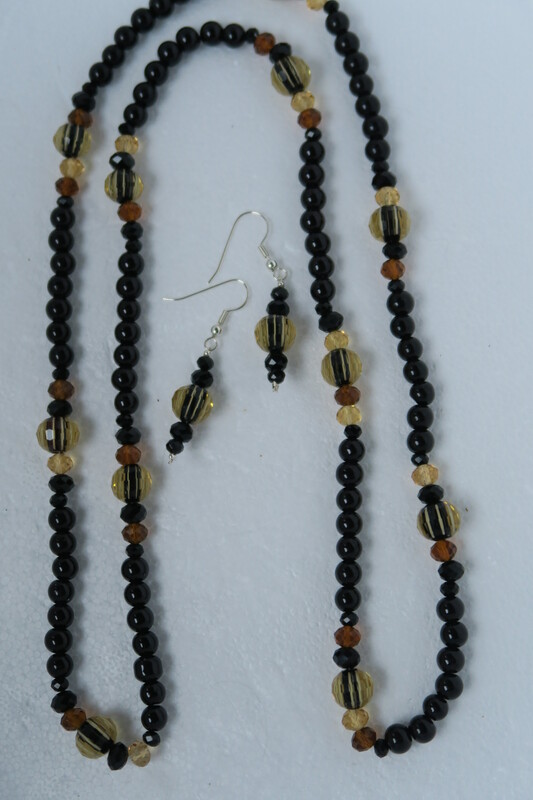 This generous 32″ long strand of smooth, shining glass is interspersed with yellow/gold crystal clear beads to make a classically elegant, yet simple, necklace and earrings set. The “hand” of the necklace is very nice and is more substantial and heavier than what you’d expect. 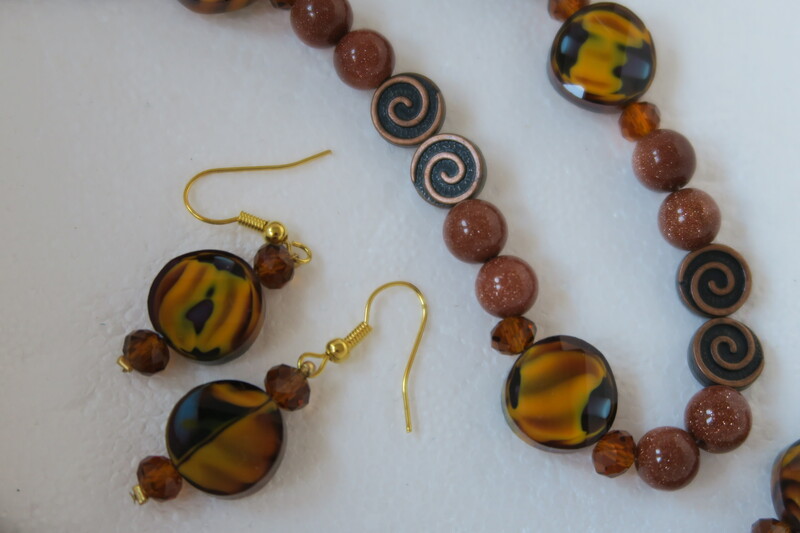 Earrings feature matching beads and are approx. 1″ long. Summer or winter, you’ll be dreaming of a butterfly-filled trail ride when you wear this lovely “Lucy Loves Horses” set! This generous 32″ long strand of seafoam green beads has a translucent jade-like appearance. Accents of silver butterflies really make the piece a stand-out and.a silver plated horse shoe adds a bit of luck to your day. These beads have a great “hand” and are heavier and more substantial feeling than you might expect. 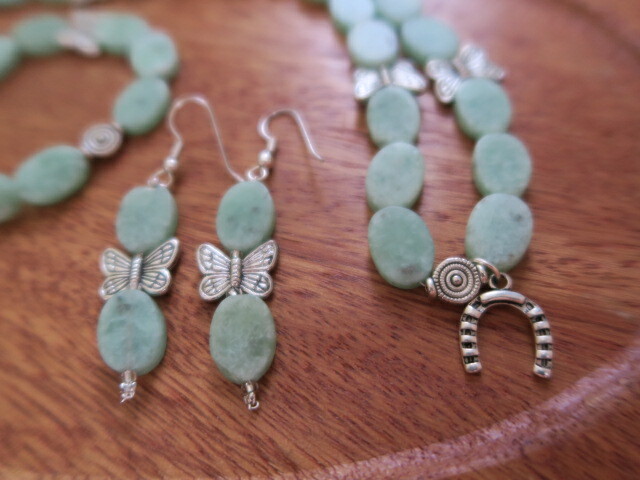 Earrings feature matching beads and silver butterflies and are approx. 1.5″ long. Quality glass beads in mottled shades of rich, ocean wave turquoise blue are interspersed with silver-tone leaves, transparent blue glass seed beads, and accented with a single silver-plated wild mustang charm which will keep your love of horses close to your heart making it the perfect choice to dress up any outfit whether it be business attire or your favorite faded pair of country-girl blue jeans. Earrings are made to match. 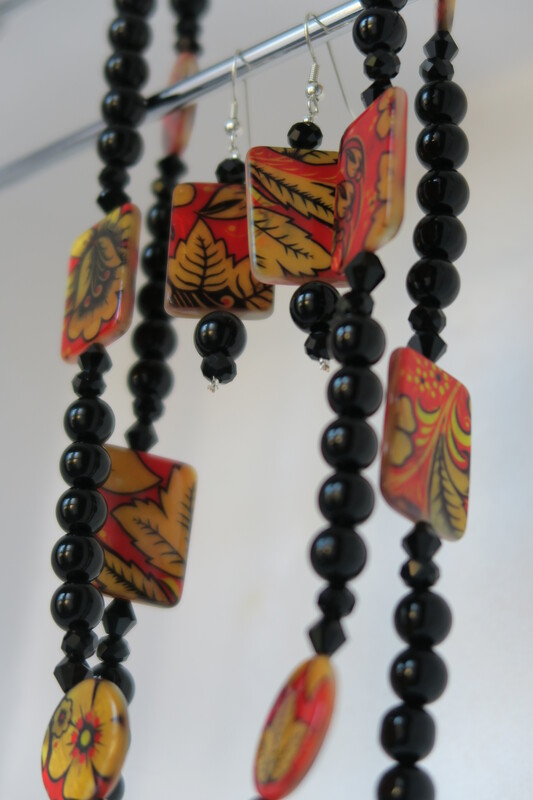 The bright, modern design of the 1 3/4“ round wood pin reflects the pattern of the leaves joining all of these stylish jewelry pieces together. 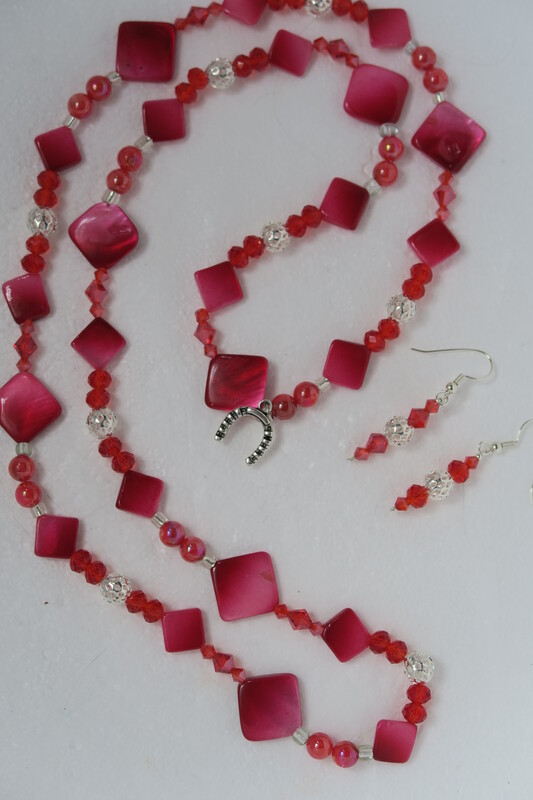 The necklace is a generous 34″ strand. You’ll love making a classic and bold statement with this sleek glass bead set with an Asian feel. Basic jet black is accented with the gold and red leaf and lotus flower patterned rounds and squares — sure to dress up a simple crisp shirt or your favorite little black dress. A quality, weighty piece, the necklace strand is a generous 36″ long. Earrings are set with silver plated findings and are approx. 2″ long. A free hand crafted gift box is included which will make gift giving extra easy and add that “handmade” touch.